Your tarts are prettier than the ones on Ina’s Food Network page. Really outstanding! Goat cheese can do no wrong, in my book. Jacob, I wanted to lick the screen!!! Those are gorgeous. I think I’ll save the recipe for next August when I can use our tomatoes. Oh my, these look so yummy! I love those words used together; tarts and goat cheese! mmmmm! These look incredibly delicious! Ina has such great ideas…and you’ve made hers even better! You’re right… this is very rustic and I love that! And you really can’t go wrong with an Ina Garten recipe… Great post! 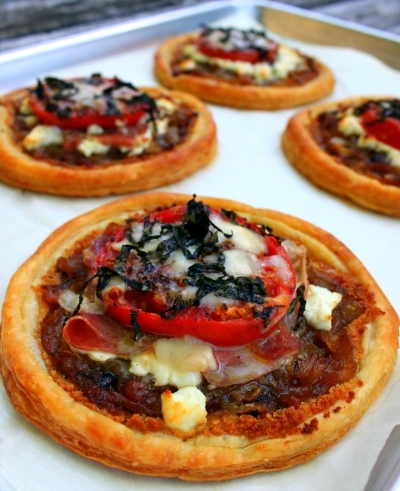 I used to make mini fetta and caramelised onion tarts whenever I was having a party and had to make finger food. Such a wonderful combination. These look gorgeous! Those are making my stomach growl. I love how your “rustic” looks so very elegant. The highlight of your blog posts are your pics- they look awesome! delicious tarts. 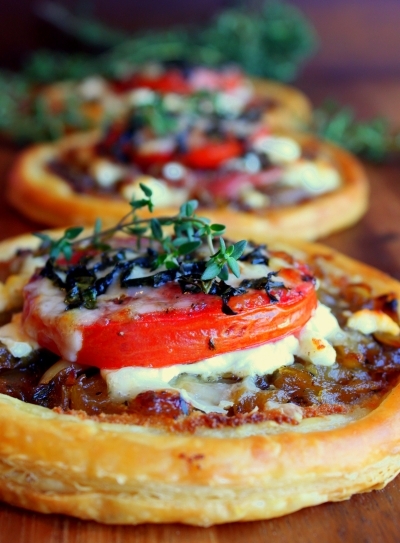 I love the little tarts and the combination of wonderful flavors, tomato, goat cheese, Parmesan cheese, and crispy crust, Yum! Great pics as always! Nicely done! What great flavors! Look scrumptious, great photos too. Love thyme – so healthy! I would like to put my hand through my computer screen and eat one of these right now.. holy cow they look delicious. I love goat cheese and these perfect little tarts look amazingly delicious! Love me some goat cheese! Looks awesome and congrats on the Top-9! Ina all around! I am watching Ina, making her brownies and reading your post. I think I just gained three lbs. Can’t wait to try this, followed by some brownies and ice cream for dessert. These are great! And with that lovely caramelized onion center, I can make them with or without the prosciutto, so as to please vegetarians in my house. Thanks! Yeah. The prosciutto can absolutely be omitted to make it vegetarian friendly, and they are just as delicious. It might even be fun (and delicious!) to have a build your own tart station with caramelized onions, tomatoes, sauteed mushrooms, several different cheeses, roasted garlic, olives, etc. Yum! Is there anything that isn’t made better by the addition of cured meat? I think not. Delicious, Jacob! God bless Ina Garten! I know, right? What would I do without Ina? I have about a hundred and fifty different cookbooks, and hers are honestly the only ones that I actually use on any sort of regular basis. I made these a long time ago (and posted them). I didn’t use goat cheese because (gasp) I can’t bond with it. Still, they were delicious. I love the way you presented these. Come summer, I’ll make them again. Nice to see you posting again! This sounds amazing, and your photos are fantastic! I just had to tweet this! Those tarts look amazing. And they remind me of summer too! I love goat cheese (and prosciutto of course) so that’s a bonus — a must try! Yum…Ina never steers me wrong! These look so wonderful and love the addition of ham…a little pork can only make things even better!! I’m making the herb-roasted turkey breast from her latest cookbook for dinner tonight, and it smells divine!!! These are just beautiful! My mouth is watering!! Oh how beautiful and delicious those look! Wow, makes me mouth water! Wow, these look divine! What a beautiful recipe. These are lovely! Ina’s recipes are great, and yes, adding prosciutto will make just about anything even better 🙂 Great job and congrats on Foodbuzz’s top 9! Yet another recipe of yours that makes me want to run out to the market for the fixings! The tarts look elegant and so delicious. Jacob, these look like heaven! Thank you Foodbuzz for leading me here today! It is a pleasure, thank you for sharing this recipe with us! These tarts are gorgeous! I love Ina too. Her recipes never disappoint me. Great work Jacob! What a great looking appetizing. Prosciutto is one of my fav ingredients. Great job! You are slacking on your foodie resolution! These tarts look amazing! Looks delicious! I had to chuckle at your opening line because the word ‘tart’, for me, conjures up images of cheap women. I think I’ve been in the UK for too long! Sounds fantastic. When you make stuff like this, what do you do with the scraps of leftover puff pastry? I love goat cheese and these little tarts look delicious! Congrats on top 9! That crust looks so good! I just found your blog, congrats on the Top 9! Thanks for sharing, I”ll be back! Magnificent Photographs all through your blog. I will be here often. Amazing photos. I thought for sure they’re high end stock photos. You have serious talent.